Away from the madden crowds at lift-serviced ski resorts, skiers can find stride and glide on many of Summit County's hiking trails and can find groomed for classical and skate-style Nordic skiing at at least five designated Nordic Centers. Free-healing, taking out the skinny skis are ways to describe skiing cross-county where we ski up and downhill. Nordic skiing it's called rather than Alpine Skiing, as downhill skiing is called at the Olympics. Nordic styles of skiing include Telemarking, which is a downhill technique that you can see on the ski mountains - and is what really is nicknamed free-healing because that is what differentiate it's look from the Alpine style where both toe and heel are clamped into bindings. 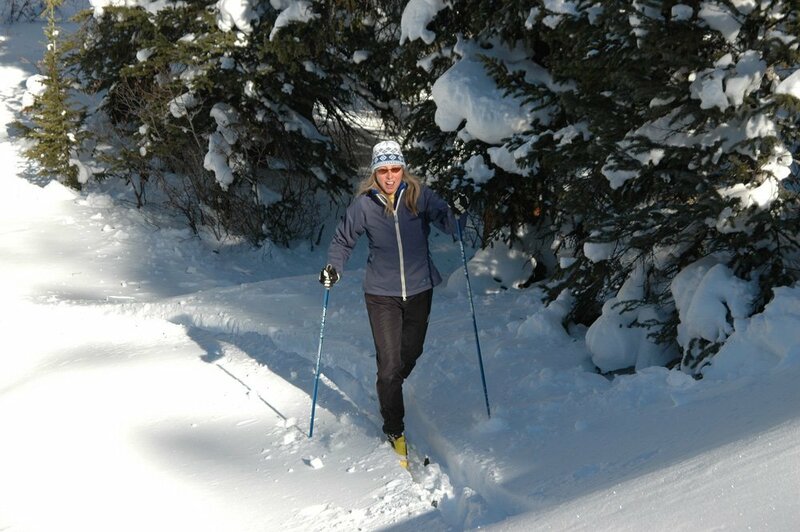 Classic is the most classically recognizable style of Nordic skiing and requires no special grooming. You can kick and glide if you know how to walk, says Gene Dayton, who founded the Breckenridge Nordic Center. Skis for this style are usually the cheapest to buy and come in a no-wax version and waxable. They have a camber opposite of how an Alpine ski curves and can get even better as they get used. Buying used Nordic equipment is just fine, especially waxable skis. The no-wax style have fish-scale patterned bottoms that can diminish in efficacy with use. And in Summit County, waxing is as easy as the sky, almost every day is Blue. Boots should feel like slippers and be comfortable. Each boot maker designs for a certain style of binding so it's necessary to match boot and binding. Lightness is what makes for easier climbing, but a heavier, wider ski can add stability on the downhills. At the County's Nordic Centers, they rent equipment, offer lessons and groom the trails for classic - two groove and for a flat wide area for skating. Skating is a technique developed by Bill Koch, the only American man to win a Medal in Nordic Skiing at the Olympics. He developed this technique to go faster and was so fast the sport had to reconsider its rules. They call the event where most skiers skate - freestyle - and set up another class of races that are just classical, and skating or any other new technique is not allowed. Skating is highly aerobic and requires a different type of ski, a longer pole and ideally a stiffer boot. Learning to skate is like learning kick boxing - you feel beat. But once you learn the technique you feel a lot more efficient skiing in these V-shapes moves. An incredible full-body workout, it is also low impact compared to running because the surface is forgiving. Breckenridge Nordic Center : take Ski Hill Road west of downtown Breckenridge. The center is opposite Gold Camp Condos on Ski Hill before you reach the Breck Ski Resort. Trails circle around the plateau that is the top of Shock Hill, and also head up to steeper trails north of the ski resort. Gold Run Nordic Center : north of Breckenridge, off Tiger Road at the Breckenridge Golf Course. Trails meander over the golf course and have a steeper, longer set of trails that head up into the Summit County open space called Gold Run Gulch. Frisco Nordic Center : off Highway 9 southeast of Frisco - directly across the highway from the County Commons. This is a very large Nordic Center with a great, flat teaching area and lots of beginner and easy trails, as well as lots of up and down that extent to Lake Dillon and for several miles north and south of the center on public lands. Copper Mountain Nordic Center: on the far east side of Copper, close to the entrance take a turn south. Lots of public land around Copper is great for cross country skiing, too.